Architects and Specifiers have an increasing number of considerations to satisfy when designing rainscreen systems to meet Building Regulations. Aluminium fire rating performance is one of the most important factors today and the following summary has been provided to help in this endeavour. Solid aluminium sheets are classified as a non-combustible construction material. Defined by BS476 part 4, aluminium alloys are non-combustible, part 7 Surface Spread of Flame ‘Class 1’ and part 6 Fire Propagation ‘Class 0’. In addition, BS 476 part 3 covers External Fire Exposure roof tests and aluminium alloys are rated AA, the highest possible under this classification system. Class 1 is a classification defined by BS476 Pt 7 – Surface spread of Flame. The test measures the distance and time a flame will spread across a surface. To the best, Class 1 – i.e. least distance and slowest of flame spread. e.g. A good Class 1 result would be the flame not spreading further than 165mm from the point of ignition over the total test time of 10 minutes. Class 0 is not a fire test but in fact a classification from The Building Regulations 1991 – Fire Safety, Approved Document B. *Achieve an index of I = less than 12 and i1 = less than 6 from BS476 Pt 6 – Fire Propagation. *This Fire Propagation test measures the amount of heat the surface is giving off during the fire. Measurements are taken frequently throughout the 20 minute test and then calculated using a special formula to achieve an ‘index rating’. Class 1 – Protects your surface from the spread of flames. Class 0 – Protects your surface from the spread of flames AND limits the amount of heat released from the surface during a fire. 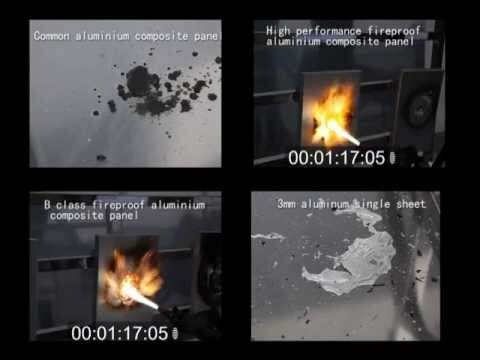 It is extremely useful to examine aluminium’s behaviour under fire conditions, with reference to its relevant properties. Most Aluminium alloys have a melting point between 600 and 660 degrees Celsius. Therefore when aluminium is exposed to a prolonged fire environment it will begin to melt (not burn). When aluminium is exposed to fire, its large thermal conductivity allows it to quickly dissipate large amounts of heat from the flame and absorb even more thermal energy from the centre of the fire, ‘cooling’ the environment and restricting ‘very hot spots’. These heat levels are comparatively greater than those of other metals when exposed to fire, therefore aluminium offers a comparatively higher response time to fire fighters. Aluminium will start melting if the fire continues and the temperature passes the melting point. In such a case, for example an aluminium roof that is melting over the fire source, the smoke and large amounts of heat are released through the opening in the atmosphere, making it easier for the fire fighters to do their job. Increasing the thickness of the aluminium panels, the thermal capacity also increases, thus offering more time for fire fighting. When aluminium melts, it begins to ‘act’ like fire-resistant or flame retardant insulation, providing even more protection time. Solid Aluminium is the obvious material choice for rainscreen systems, but some Architects might be wondering how the various finishes like polyester powder coating and anodising affect these impressive ratings. Results from the Interpon D Fire test report for the performance of aluminium which has been powder coated, met the criteria for Class 0 building regulation approval. The test report is available for download here. An anodised finish is nontoxic and chemically stable. The anodic film is non-combustible.